Something deleted all my calendar entries, for the second time. I updated an entry and went to save for "this and following entries". All calendar entries were deleted: Appointments, reminders, tv schedules, you name it, probably 100 of them. I reentered everything. Called doctor offices to get the appointment data. Each one required about 12 clicks to enter. Today, almost 6 months later, I am updating one entry that is repeated. I hit "this and all following entries" and again, all entries are deleted. What do I do to prevent it. I believe that everything is being backed up but has the system backed up an empty calendar removing the working version? How do I restore a version that has been backed up in my Google account? Try to find which app deleted your calendar data. 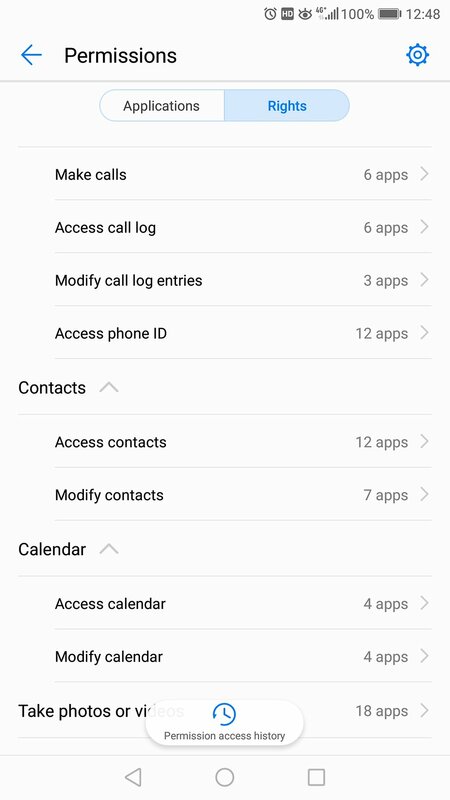 Go to Settings - Permissions, check which app has the permission of modifying calendar. Refer to a screenshot as below. If you have backuped or synced your calendar data to cloud server, try to restore it. It really scares me that you suggest that other apps can delete calendar information but I am sure that this problem is entirely within the calendar and that this poor design is what is allowing me to totally clear it. I cannot imagine why some ying-tong placed an option, so easily triggered, in the normal menu and without a "Do you really want to completely clear your calendar?". Something like that should be well hidden. I speak of a saving option after I make changes. I figured this out after p[lacing the original question. Even now, after realizing this, I see "For This and all following entries" to be the problem. It clears everything instead. Now that I seem to figure out how it happened, how do I recover? How do I restore as you suggest in step two?